FixWin 10 is a powerful Windows 10 utility that is designed to repair all Windows 10 errors and problems with just a click!. It's a portable utility thtat can increase Windows 10 performance by resolving the most common Window issues. FixWin is also available for Windows 8, Windows 7, Vista and XP. 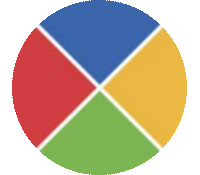 FixWin 10 Free Download Latest Version For Windows OS (XP-7-8 and 10). Get the offline setup installer of FixWin 10 with a single, direct and secure link. The downloaded setup file is compatible with both Windows 32 and 64-bit versions. FixWin 10 for Windows 10 is a portable utility freeware that lets you repair and fix Windows 10 errors, annoyances and issues. This new release of FixWin now supports Windows 10 and has a complete section to repair and fix the most common Windows 10 errors and issues specifically. FixWin 10 is a useful utility to repair operating system errors and problems through a simple and intuitive graphical interface. 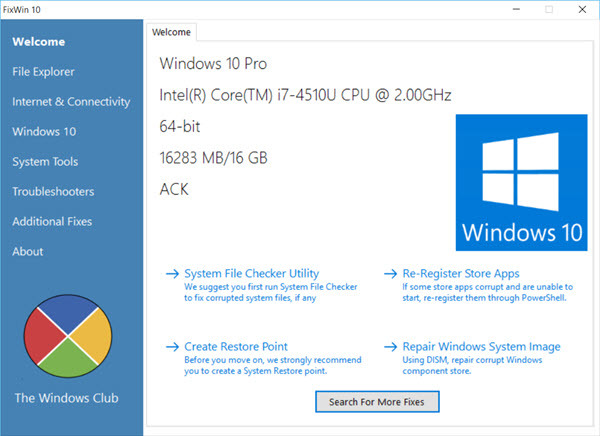 FixWin 10 gives us access to different tools and options that will allow us to analyze the computer, search of errors, repair damaged files, solve problems related to the Windows File Explorer, detect and solve connectivity problems and Internet access or create a system restore point. 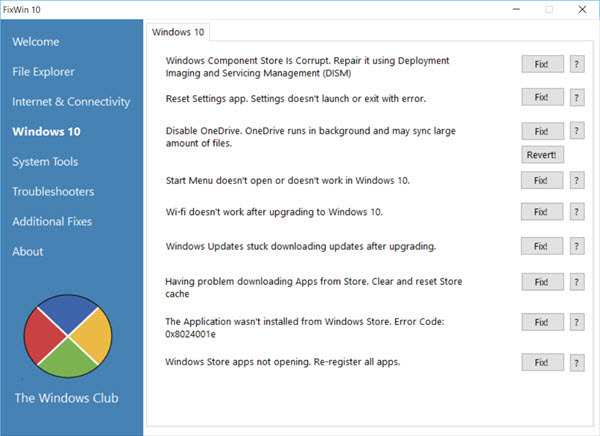 Some of the most common problems that occur after updating the operating system are that system tools stop working properly, the system configuration does not start or an error occurs when trying to reestablish them, the Start Menu does not open, the applications of Windows Store does not start or we do not have access to Office documents. Besides being a very practical tool that allows us to enjoy an operating system without errors, you can download FixWin 10 for your computer, use it as many times as you want, without limitations or restriction. Do you want to enjoy all the advantages and features of Windows 10 as the first day? Start by downloading FixWin 10 for free. After downloading FixWin 10 for window 10 you can solve all these errors and correct these problems with just one click! It has a small size and does not consume system resources. Very fast and has an attractive interface. Easy to use and requires no experience. Offers multiple fixes for Windows 10. Software Name: FixWin 10 Free Download. Click on the button below in order to download FixWin 10 Free Download for PC. It's a complete offline installer and standalone setup of FixWin 10. This file would be compatible with both 32 and 64-bit windows.